With the start of the fall semester, it is estimated that over 24 million students nationwide will be riding the school bus, making it the country’s largest source of mass transit. While school buses provide a convenient and much needed service for families all over the U.S., there are some important rules and regulations that must be followed by children, parents and other motorists to ensure a safe trip both to and from school. An overwhelming majority of fatal accidents involving school buses result in deaths outside of the bus, such as pedestrians or other drivers. This highlights the fact that students need to be careful and attentive both in and around the school bus. Although it might not be apparent, the bus stop is a place where kids need to pay attention to their surroundings. This can be difficult, especially if they are at a location with a group of their friends, an environment where distraction is inevitable. However, there are some very easy, yet important, precautions students should take while waiting at the bus stop. When heading to the stop, make sure your child walks on the sidewalk. If there is no sidewalk available, walk on the left side of the road, facing traffic. To avoid having to run, make sure you send them out the door with enough time to get to the bus stop with at least five minutes to spare. You should also remind your student that, once arriving at the bus stop, he or she should wait in a safe area that is not in or near the road itself. Kids should be sure not to run around too much and to be aware of their surroundings, as streets are usually busy with people driving to work in the morning. When the bus arrives, kids need to wait for it to come to a complete stop and watch for the flashing red lights and extended stop sign. They should only cross the street when traffic is clear, and remember to look both ways before crossing. Once on the bus, children should pick a seat and sit down immediately, remaining relatively quiet so that the driver can concentrate on the road. Making noise or engaging in rowdy behavior should be avoided at all costs, as well as throwing things out of the bus windows. You would be amazed at how often this happens, putting both the bus passengers and other motorists in real danger. At the end of the school day, it’s a good idea to instruct your children to walk at least five steps away from the bus immediately after they get off. This will help ensure that there are no accidents when the bus begins to drive away. Once they have arrived at their stop, students should go directly home so that their parents or guardians know where they are. There are a number of rules and regulations that motorists need to be aware of when driving with school buses on the road. The most important is that you should always stop whenever a bus is loading or unloading passengers. Usually, the bus will have flashing red lights and a stop sign extending from the driver’s side. A good rule of thumb is to treat this sign just like any other stop sign. Passing a school bus that has its lights flashing is extremely dangerous for the passengers who are entering or exiting the bus. Not only that, but the fines that result from such a violation can be steep, as many localities have heightened the severity of this crime due to the dangers it presents. While millions of students will be riding the bus to school, many others will be hitting the road as new and inexperienced drivers. Studies by the Centers for Disease Control have found that motor vehicle related injuries are the largest health risk to teenagers nationwide. In fact, the risks for crashes for 16 to 19-year-olds are higher than for any other group on the road. To help avoid serious accidents, parents need to take the time to teach their teens how to properly drive. Although driver education classes lay down a sound foundation, it is up to parents and guardians to practice, encourage and teach safe driving habits. The more experience a teenager has behind the wheel, the less likely he or she is to get into an accident. 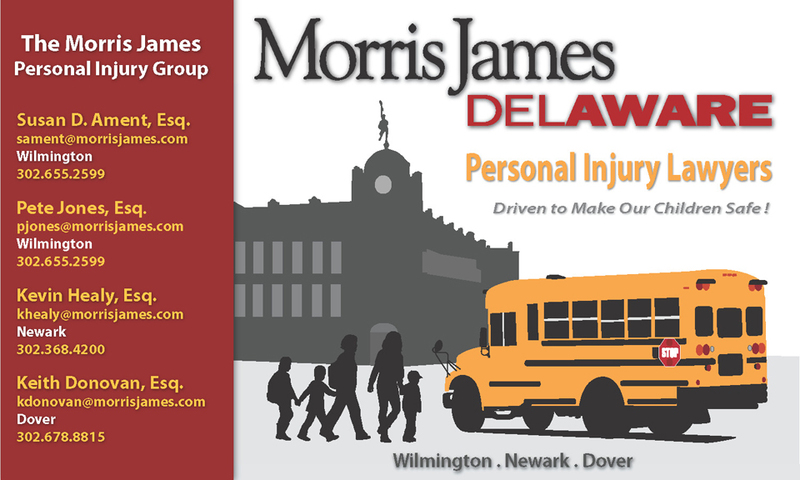 The Morris James Personal Injury Attorneys have over 90 combined years of experience representing victims injured in motor vehicle accidents. We have unfortunately found that many accidents occur throughout the school year and involve school buses or minor pedestrians.